NVU's new Phoenix platform instruments are a completely new way to look at how gauges are used, built and installed. NVU started from scratch, using over 20 years of data from customer experience, user interface, manufacturing, design, competitive products and long range planning. The Phoenix Platform gauges offer an unsurpassed amount of functions, tech and style in a standalone instrument package; all without any additional driver boxes, adapters filters or modules. High-tech mini-OLED displays give the optimal amount of information you are looking for without bulky, unattractive screens. High-tech driver modules run the new stepper motors. Easy to read menus, set-up and programming features take instruments to a whole new level. Best of all, as we add features, all updates are reverse-compatible, your kit will never be out of date. The internals are Just for starters, NVU's update has also brought some great new visual/quality improvements. New cases, bezels, pointers maintain your favorite NVU styles with a fresh look. 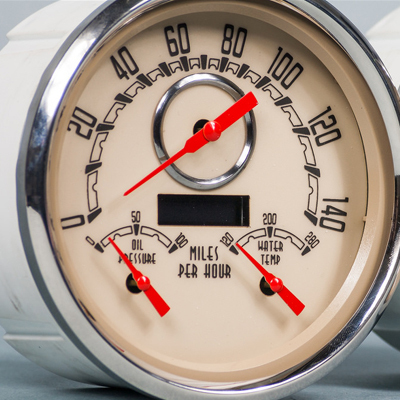 NVU is the ORIGINAL period styled and themed instrument company, others may try to replicate, but they will never be able to duplicate the style, function and quality of NVU gauges. The key to all Phoenix instruments is the OLED screen. 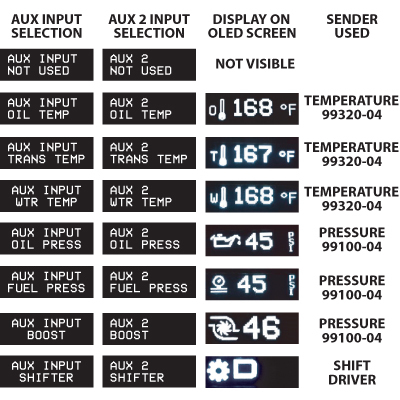 NVU's mini-screen displays all of the functions you could ever need in the same size as a traditional odometer window. This give you the graphic look you want, maintaining all of NVU's exciting, exclusive designs while adding all of the great new features. The new graphic OLED display now offers more features WITHOUT ANY DRIVER MODULES! (excluding gear indicator) Simply add a NVU temperature or pressure sender select the function you want to monitor and off you go!. 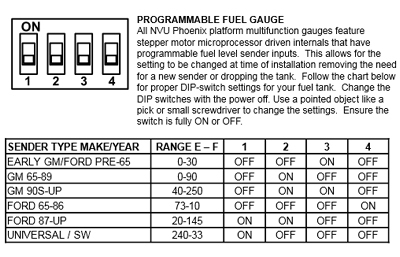 You can add up to 3 additional inputs per 6 gauge kit. All Phoenix instruments with an OLED display display vehicle voltage. Speedometers will accept one additional input, all tachometers and speedo/tach combo gauges will accept 2 additional inputs. That gives you up to 4 additional gauges. This is just the beginning of the auxiliary features available on the Phoenix instruments. NVU will be adding more and more over time. Already have a set of Phoenix gauges or don't want to wait for more features? Don't worry, all Phoenix instruments are forward and reverse compatible and can be easily updated with new software. Additional inputs are available on a custom basis, call the NVU factory for more details. NVU listened to customer feedback about pointer placement during normal operation. Temp ranges and operating points moved to be more centered in the sweep for easier viewing. New Temperature ranges also keep the operating range more in line with today's build that run hotter, more horsepower, computer-controlled engines. 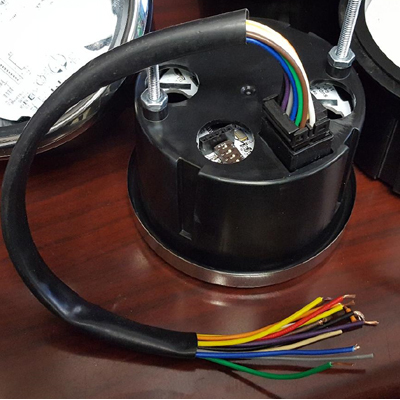 All NVU multi-function instruments, speedometers and tachometers use a new 12-pin AMP plug with color coded 18 ga wire. This makes installation a snap and no boxes or adapters with jumpers. 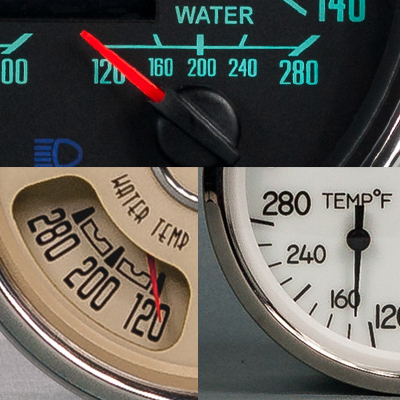 To add all of these great new features NVU had to update the entire exterior of the gauges. Black bezels: 100% new, re-tooled bezels with black satin finish, crisp lines, nice details-still waterproof! 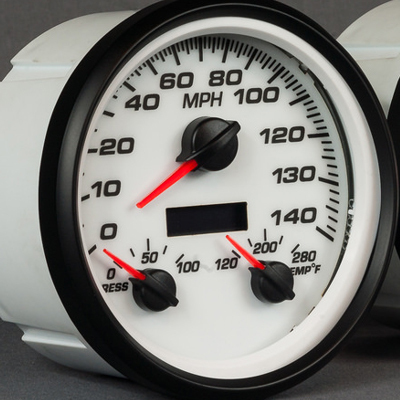 New cases on 4-3/8 and 3-3/8" gauges molded from ABS/Ploy composite, virtually indestructible. Perimeter Lit pointers: NEW, finer detail, more period styled metal die cut pointers with brass spun hubs and shaft. add more of a traditional look to the already outstanding NVU styled lines. Brighter reds and whites. 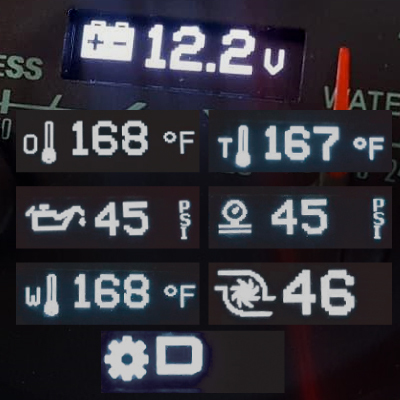 Deadfronted indicators: Now instruments that have indicators will all have deadfronted (invisible when off) lamps. All colors have this feature to maintain NVU's clean look. 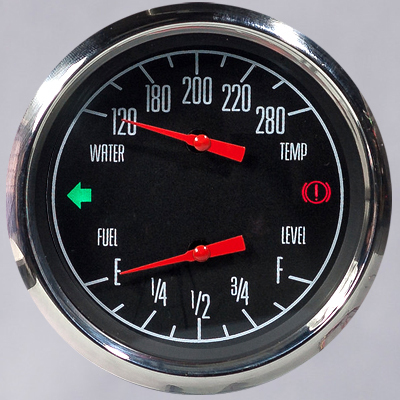 NVU was the first to offer icon indicator lights standard in gauges. Custom ranges also available please give NVU a call. Best of all, the fuel gauge is electronically dampened, no more wacky pointers with tank slosh or twitchy sender problems. With the move to stepper motors all multifunction gauges have wider, linear sweeps. This takes sweeps from 85-90 degrees to 100-120-180 degrees which means better resolution, more graphic interest and more custom flexibility. We can move any pointer any direction at any speed unlike fixed air core meters. Do the NVU Phoenix instruments work on GM LS and Duramax engines? What series are the Phoenix features available in? The Woodward, performance, 1940 and 1967 series are all Phoenix instruments. Our Gen II stepper gauges are transitioning over eventually. All 3-1 and quad gauges use the phoenix platform as well. What sizes are the gauges? Are the Phoenix features available in NVU direct fit kits? How do I use and set up these features? Below are some quick videos, more to come to check back often! Quick run-sown of the new phoenix features. Setting up is EASY with our new OLED screen and simple to use menus. User settable odometer mileage quick set-up. 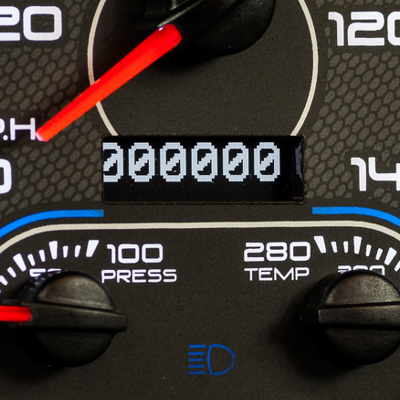 You can set your odometer during the firs 100 miles of use to match your vehicle. More Phoenix features shown in our 67 mustang panel. You can add a shift input to the OLED with our simple decoder. Video of acceleration test on one of our GM LS test vehicles.